No one knows exactly why (or how) Banksy pulled of his latest stunt: shredding a painting just after it was auctioned off for $1.4 million. "What’s the opposite of LOL?” the British street artist posted to Instagram. Donald Trump’s star on the Walk of Fame has been hit with yet another round of destruction. Charles Dwight Stout III admitted to vandalizing the Islamic Center of Murfreesboro with graffiti and strips of bacon. 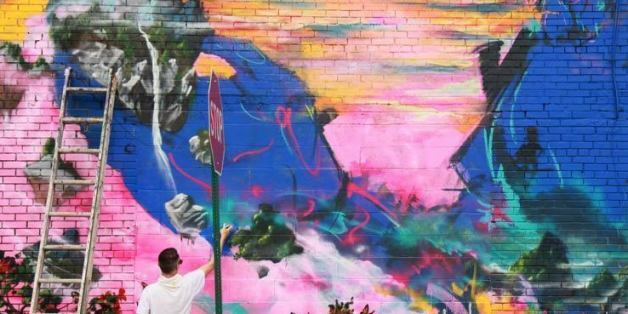 The company soon said it would withdraw a lawsuit claiming Jason “Revok” Williams couldn’t assert a copyright on his mural. This might really scare the bejesus out of hikers. She said "yes" and cops read him his rights. Students weren't here for their president's visit to the White House. Pretty, empowering and environmentally friendly. This is the lesson that will shape who we are tomorrow. Let's get it right. "It's generated a new wave of Banksy wannabes." An artist takes on translating tags. Co-Founder of Rebel Nell. Motivated by the Motor City. What truly is a social enterprise? To me, a social enterprise is one that prioritizes serving a purpose or fulfilling a need over financial gain.